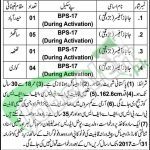 Get the recruitment offer from Headquarters National Guard 5 Corps Karachi Jobs 2017 Pak Army Latest. Applications are knocking the doors of unemployed applicants who are having the passion to be recruited in nay field of Army so, currently the advertisement is from Headquarters National Guard Corps 5 Karachi intends to hire the energetic, caliber and well disciplined applicants in Four Janbaz Training Teams to fill out the following posts which are similar as (Janbaz Officer) are required to apply for such posts. Applicants will be given attractive salary package equivalent to BPS-17 during activation. Candidates will be placed in different places for recruitment as Hyderabad, Sanghar, Thatta and Kotri. Age of the applicants should be 18 to 30 years and qualification should be B.A/BS.c, F.A/FS.c is required to apply for such posts. Applicants who got retired from army upon their own will and possess the age limit not above than 35 years with qualification as same as mentioned above are also eligible to apply. So guys, don't get late and get ready to apply before the time lost. Now, I will let you know about its further details below. Applicants are required to apply simply by writing their application on a plain paper indicating the self name, father's name, postal address along with telephone number and attaching all the educational and experience certificates, CNIC, Domicile and one fresh passport size photograph should reach at the given address. Last date for submission of application is 31st August 2017. Late received and incomplete application will not be accepted. So, for more jobs stay connected with this page ever. Address: Headquarters National Guard 5 Corps, Log Area Complex, (19 Liaquat Berak), Karachi Cantt.